Meccano 'Rolls Royce' Model Car. 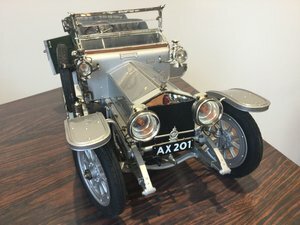 Meccano Rolls Royce Model Car. Scratch built from parts - not a kit. Measures 20" long x 8" wide . Free delivery within the UK Will post oversea's please ask for a rate. 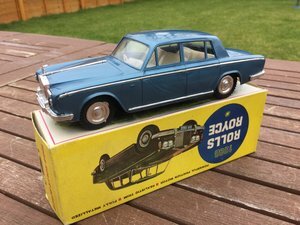 Very scarce 1960s fairy lite scale model of a Rolls Royce silver shadow series 1,very rare collectible model from the late 1960s in mint condition with original box.. Scarce large scale 1/12 RR silver ghost by franklin mint,part of their rare connoisseur range,extremely good quality large all metal highly detailed model of this iconic motor car,comes with original packaging..
A Mint and Boxed example of the "Rolls Royce Corniche" in the very rare Colour variant of "Silver Sand". This a very well Detailed Collectable in 1:36 Scale from CORGI. This is from 1986 and the Model Code is # C279/2. Thanks for looking. Location New Brighton, £89, Post paid.